Raffle Tickets are $1 each and are sold in books of 10. 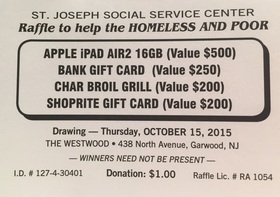 Please enter for a chance to win one or more of these terrific prizes while supporting St. Joseph's efforts to help the poor and homeless. You do not need to be at the dinner to win, although we would love to see you there! Sponsors are still needed for dinner tickets. To become a sponsor, or to order raffle books and dinner tickets, please call St. Joseph's at 908-352-2989 extension 3 or 4. For the form to order by mail, please click here.